by keeping our immune system young and more able to fight infections. 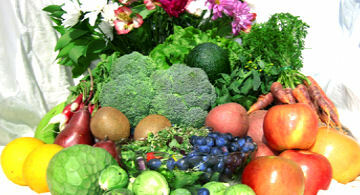 Eating fruit and vegetables has a vital role in keeping a key part of the immune system young, scientists have found. The thymus gland is located in front of the heart and creates T-cells which help the body fight infections. It is quite large in children and adolescents, but as we grow older it shrinks faster than any other tissue in the body. Its decay puts older people at much greater risk of infection. Now research has found that antioxidants such as vitamin C can keep this vital organ healthy by stopping the damage in its tracks. Experiments showed that antioxidants – found in fruits and vegetables – stopped the thymus from shrivelling. In mouse studies, animals given vitamin C and another antioxidant used in human medicine experienced significantly less age-related deterioration of the thymus. Lead scientist Dr Howard Petrie, from the Scripps Research Institute in San Diego, California, said: ‘The thymus ages more rapidly than any other tissue in the body. ‘It diminishes the ability of older individuals to respond to new immunologic challenges, including evolving pathogens and the vaccines that may otherwise offer protection from them.